If you’ve ever played Star Wars: Commander, you probably know how fun the game is, but you also know that the game also comes with a very long list of issues that Disney should definitely be addressing (and hopefully they are). First, though, let’s focus on the good stuff. Commander really is a fun game, allowing you to build your own base from scratch and play with players from around the world as you compete for resources and medals. As part of a group, you’re charged with not only defending your own territory, but also assisting your comrades with troop donations. During your time with your group, you’ll be listed as one of three ranks: Member, Officer, or Leader. Obviously, the Leader is the top dog of the group, able to remove and promote/demote members with the tap of a screen. Leaders are the creators of the different groups, and anyone can start their own. Officers are much like the Leader in that they’re able to remove people from the group, helping to keep the number of inactive users to a minimum. As for members, they have no real power and can only visit the other members and donate troops. Medals play a vital role in Commander. The idea is to gain as many medals as possible by attacking and defending. I find that attacking is the best way to gain; defending, unless you’re able to hold back over half of the attack in a minute and a half’s time, will more than likely result in a loss of medals, a loss of resources, or both. Resources consist of alloy and coins. Coins are a great way to expand alloy production and upgrade some buildings used for offense as well as troops, while alloy serves as a way to boost defenses and keep your coin production high. First of all, before starting the game, you’ll want to make sure you have a Facebook account handy so you can save your progress. Otherwise, uninstalling the app will force you to have to start over. Once you’re signed in, you’re ready to start. During the last couple of months I’ve been playing the game on my tablet, starting with the game’s initial release on Windows, one thing has been my constant companion: loading issues. These issues range from server issues to connectivity problems to random crashes. For instance, the app must be completely shut down after each use, not simply minimized. Otherwise, you’ll find yourself in a loop of problems that ask you to continually try to reconnect, which has never worked for me. To work around this particular issue, instead of trying to reconnect, I’d simply shut down the game and reopen it to fix it. Last night and into this morning, I also experienced problems loading the latest update. It would completely freeze on the “loading” screen and would not move beyond about 10 percent load, no matter how long I let it sit. This eventually forced me to completely uninstall and then reinstall the game. In these instances, you’ll have to play through the initial tutorial levels again before you’re able to log in and reconnect with your Facebook account. It would be nice if Disney allowed you to log in from the beginning so you didn’t have to waste time. There’s also an issue when trying to watch a replay of any attack. The game will try and load the replay for a moment before showing the “Error” dialogue box with an “unable to connect to the server” error message. I wasn’t the only one experiencing these issues either; a few members of my squad were also having problems, and one member was even completely removed from the squad, then readded and re-promoted, all within the span of a few minutes, long enough for all troop donations and receptions to be set back to zero. Thankfully, the latest update appears to have fixed some of these issues after the fresh reinstall; it’s no longer freezing on the loading screen, which helped redeem the game’s rating a little. While the latest update does fix some issues, there are still a number of them that continually plague the game, which really hit the game’s rating hard. After reporting these issues and being told to once again uninstall and reinstall, which clearly would not fix the problem, it becomes clear that the game could use a little work. 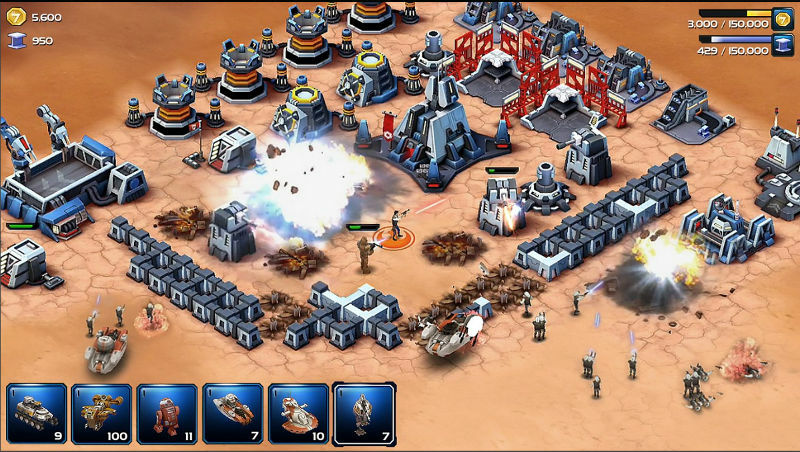 When it works, Star Wars Commander is a fantastic and fun game, mixing social, free-to-play, and simulator into one unique experience. Beginners and experts alike can find a lot to love here, with the game keeping you pretty well matched to players in your experience range. Star Wars fans are sure to love it, as will anyone who enjoys some good strategizing and online competition. If it weren’t for the errors that can crop up at any time to ruin the experience, Star Wars Commander would be my current favorite game on the Windows platform. If you’d like to try the game for yourself, you can download it via the QR code above or via the Windows Store. Are you playing Commander? Share your own experiences with the game in the comments below. At least you can get it to load. I can’t even open it without it crashing and I’ve tried uninstalling, restarting, everything. :/ Windows Phone lumia 920. I gave it a one star review in the store. It works okay for me on Surface, but on my Lumia 820 it’s very buggy. Definitely has connectivity issues, and I think they were having server troubles yesterday, but not sure. I wouldn’t say the issues are constant, but they pop up quite a bit. It’s sad that Windows users have to put up with this from developers. It doesn’t load at all since yesterday. Great copy of Clash of Clans from iOS but it’s literally plagued with errors…. I am getting failed to connect to server error Help??????? ?